Here are a few more samples of the Tea Shoppe card, which I will be showing my group of crafty ladies this coming Wednesday. I decided to try coloring in peach tones. I've been working on a stamping tutorial for my card-making group, and I decided to resurrect an oldie-but-goodie stamp set: Tea Shoppe by Stampin' Up. 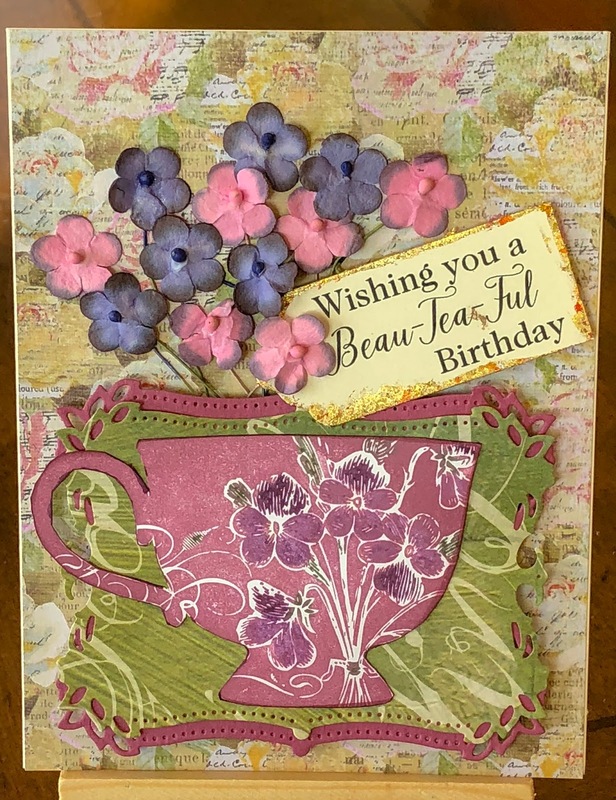 I fell in love with this stamp because I am a huge tea drinker! 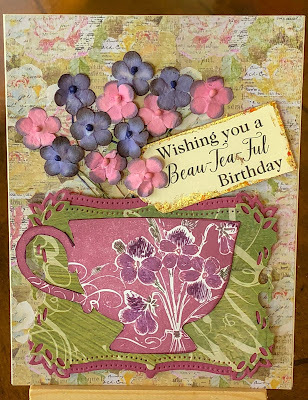 I have lots of friends who are tea lovers, too, and I like to send them birthday cards. Just a few years ago, it was quite a process to create multi-colored hand-stamped images. 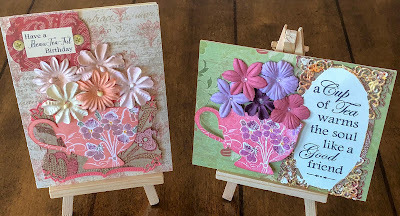 I had to use individual acrylic blocks with unmounted stamps (or worse, wood-mounted stamps). 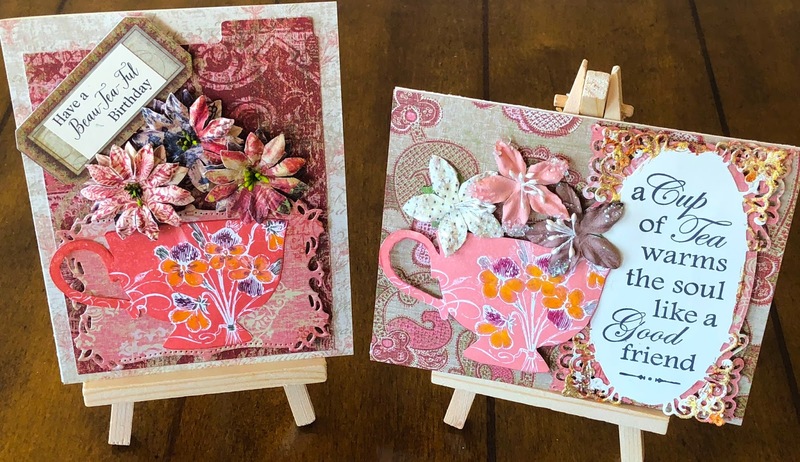 I’d ink or color, then reposition and line up the stamp over and over again to achieve the desired color combination on the image. This was not a precise technique. Lots of fuzzy rejects found their way into the trash! Then the folks at My Sweet Petunia created the Most Incredible Stamp Tool Invented (MISTI), and they changed the way we all stamp. Now, you can adhere your unmounted stamp to the platform and secure your paper, and nothing moves. 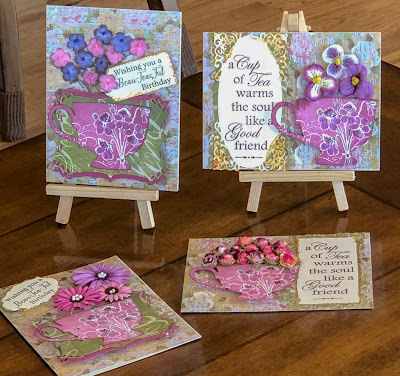 You can ink and stamp the image as much as your heart desires, building up the colors from your ink pads, paints or markers. 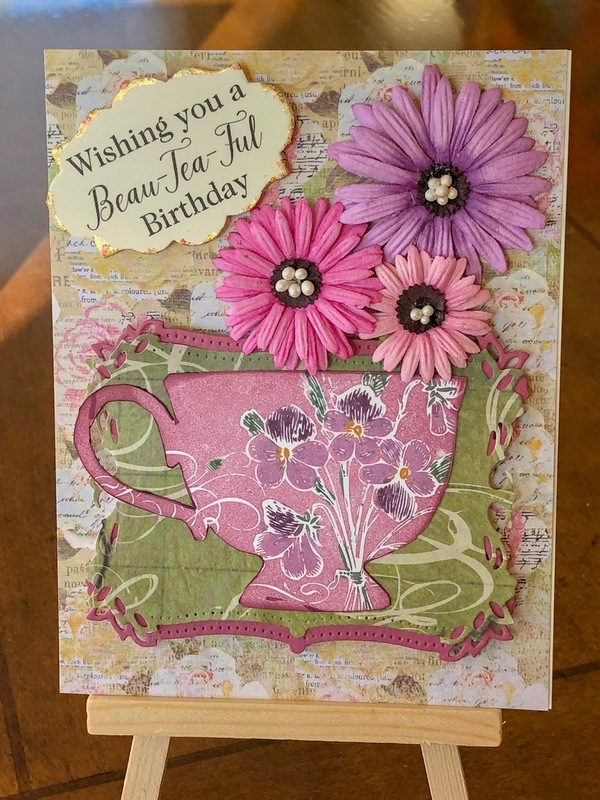 On a stamp like the Tea Shoppe, you can create vibrant pansies on the cup by using markers. 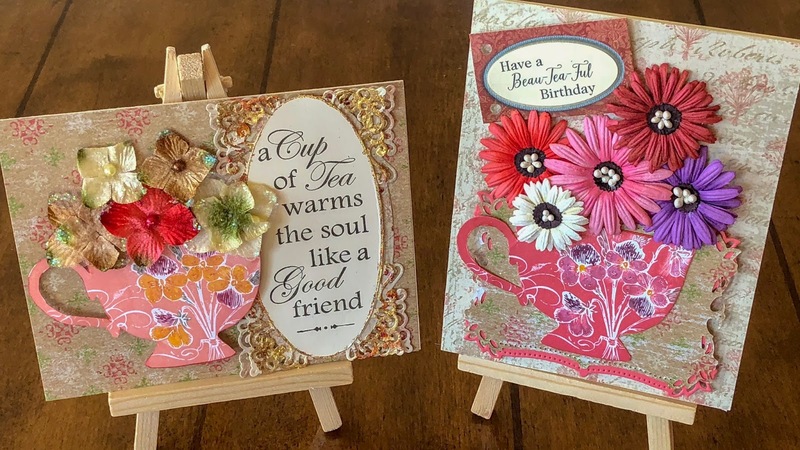 On these cards, I’ve used a variety of embellishments, such as making background frames with Spellbinder dies, adding in Prima flowers, and gilding edges of the text pieces. 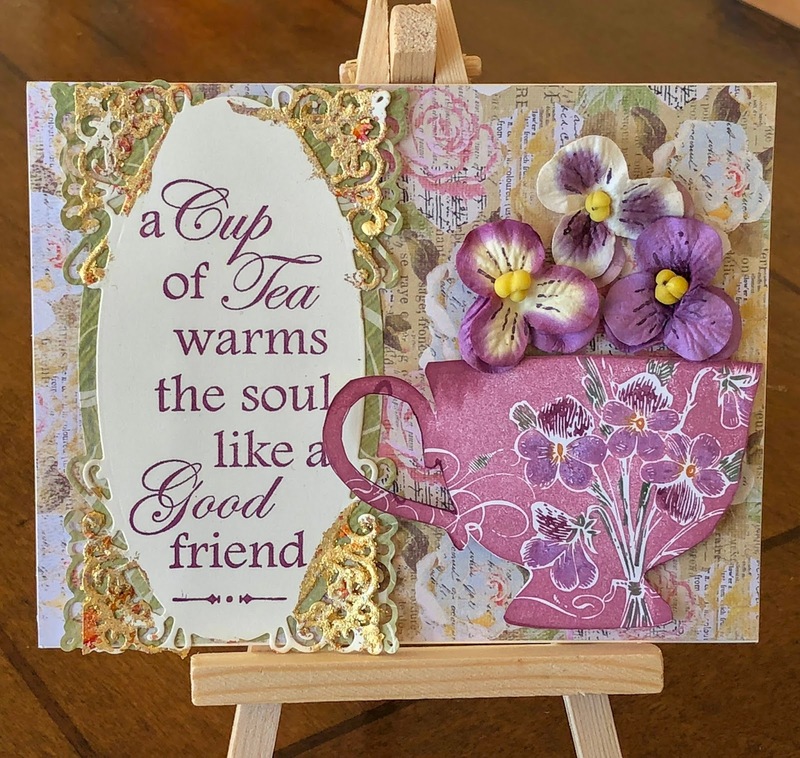 In addition to the Stampin’ Up Tea Shoppe set, I’ve also used a sentiment by Graphic 45 (Botanical Tea) and my own digital stamp (Beau-Tea_Ful).